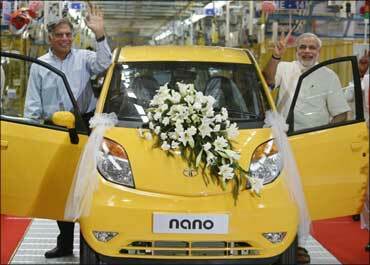 Rediff.com » Business » Now, a gold-bedecked Nano car from Titan! Now, a gold-bedecked Nano car from Titan! Fancy a flashier ride? Gold Plus, the jewellery division of Titan Industries, said it will come out with the world's first 'jewellery car' by embellishing a Tata Motors Nano with gold designs as it celebrates 5,000 years of Indian jewellery. "This event is about showcasing the 5,000 years of Indian jewellery celebrations... We will be bringing out the world's first jewellery car -- Goldplus Nano -- similar to the chariot...," Titan Industries COO (Jewellery Division) C K Venkataraman said. The company's designers have been working on the designs for the Nano, which is touted as the cheapest car in the world, for over six weeks, he said. "An internal team from Titan Industries has shortlisted three designs for the Nano and the one design which receives the most number of public votes will be selected...," he said. For embellishing the gold designs on the car, Titan Industries has gone in for a technical collaboration with the Tata Group. He declined to comment on the value of car, since it would be decided later. "We don't know how much gold will be required to make it...," he said. "Nano has become a symbol of middle class and with this gold design, we will ideally keep it as a great art work of jewellery on an automobile...," he said. The jewellery car will be designed at the Hosur manufacturing facility of Titan Industries, he said. The car would sport some of the finest gold jewellery designs from Kolkata and Rajasthan, he said. It would not undergo any re-engineering work, he added. Noted actress Ramya Krishnan formally launched Titan Industries' Goldplus Nano campaign on Wednesday. The campaign ends on December 12. Could Noel Tata be the next Tata chairman?